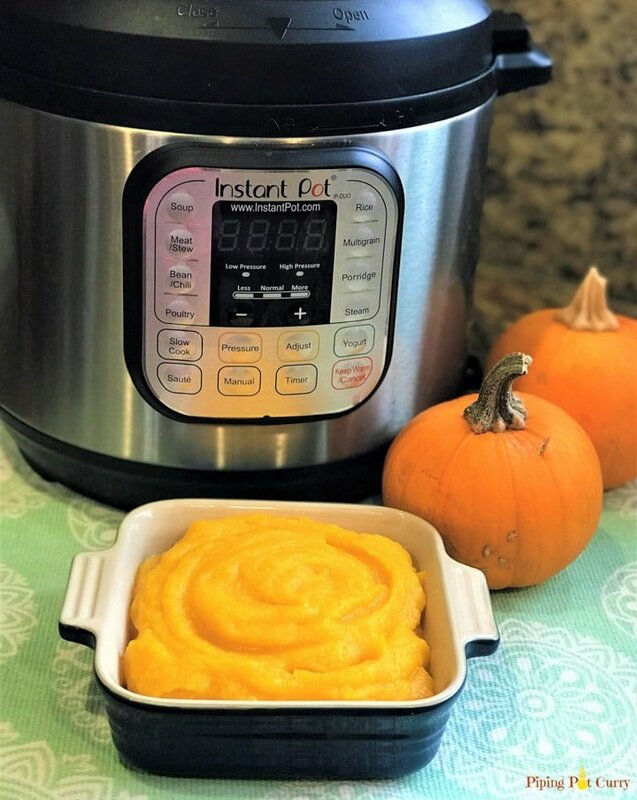 Making fresh pumpkin puree is now so easy in Instant Pot. NO peeling or cutting of pumpkin ahead of time. Use it in your favorite recipes – pie, cake & more. Do you still have some pumpkin’s sitting around? This used to be my story every year. But now I have the magical Instant Pot, so not anymore. 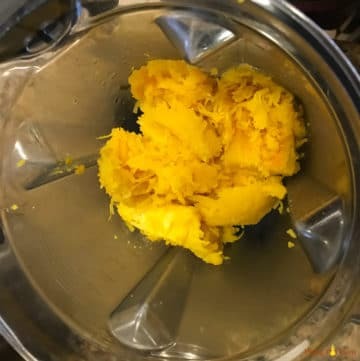 Making fresh pumpkin puree is now so easy, that I don’t have to think twice. And the best part, NO peeling or cutting ahead of time. I am not much into buying canned food, and like to make things from fresh. 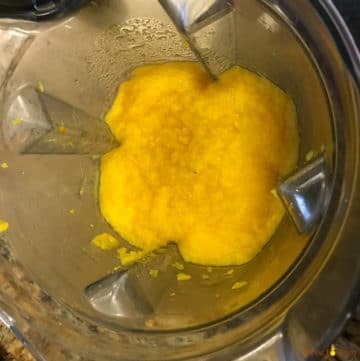 So this is my new adventure with the instant pot to make pumpkin puree, and I plan to freeze it and use it for the next 6 months. 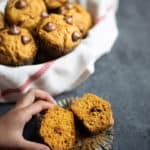 I have used this pumpkin puree to make my Healthy Whole Wheat Pumpkin Muffins. I used pie pumpkins (also called sugar pumpkins), but the same process works for butternut squash as well. 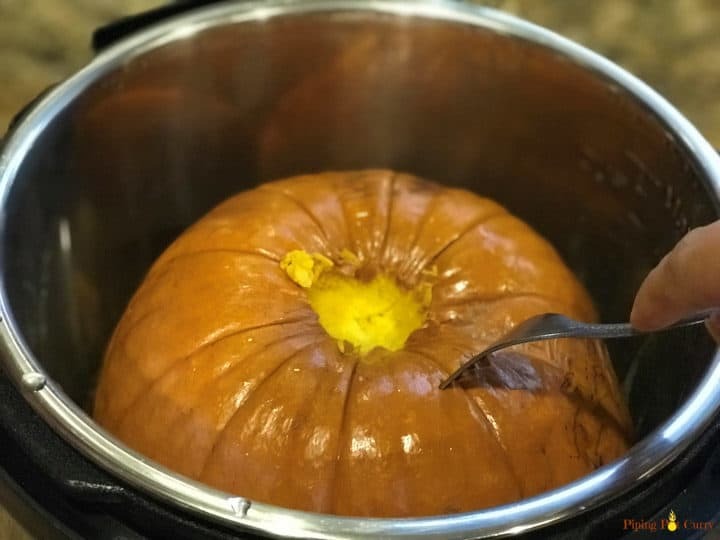 Buy pumpkin’s that would fit in the instant pot you have. I have the 6qt and it worked pretty good for a decent sized pumpkin. 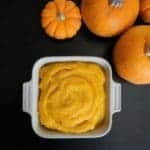 How to make pumpkin puree in the Pressure Cooker? Get your instant pot ready with a cup of water in it. You can place the pumpkin on the trivet or directly in the pot. The pumpkin I had did not fit in with the trivet, so I tried without the trivet and it worked perfectly. Well, the pumpkin fit, but the stem did not and it was too hard to cut the stem off, so I let it be :-). The advantage of using a trivet (with handles) is that you can easily pick the cooked pumpkin out using the handles. Isn’t it great? Just keep the whole pumpkin in, NO prep at all. 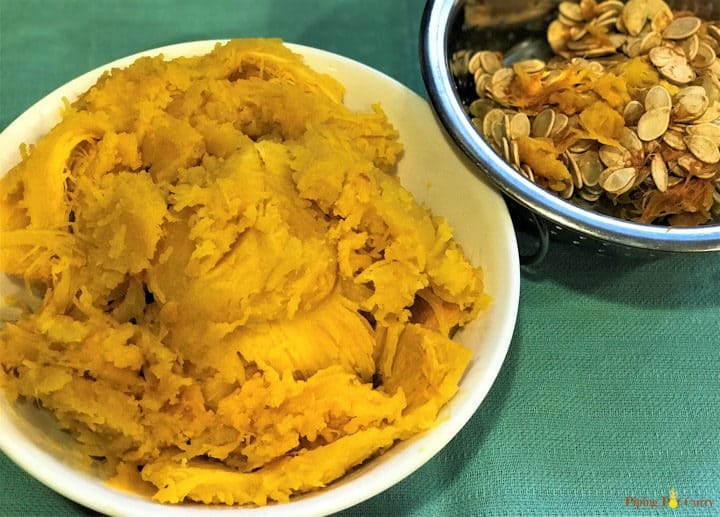 I even removed the seeds after cooking the pumpkin (Save the seeds and roast them…yum!). After cooking, you can check with a fork if it is done. Be careful while taking the pumpkin out of the pot. I drained all the water and let it cool a bit before taking it out. Then cut it into two, and remove the seeds. Then scoop the flesh out of the skin, it should come off very easily. You could also turn the pumpkin and first remove the skin using your fingers or a fork. Put the flesh in a blender or food processor. I used the Vitamix (another one of my favorite kitchen appliance). I had to add about a cup of water to get a smooth texture. Add a little at a time, so you still have thick puree. 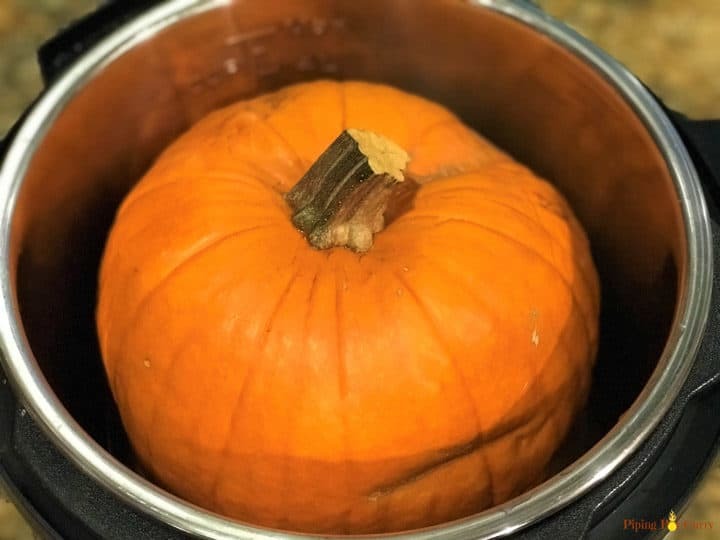 It is important to note that, as we are pressure cooking the pumpkin along with water in the pot, the puree will have more moisture than the oven roasting method. 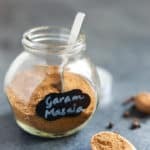 This puree is perfect to use in a number of ways – pie (of course), muffins, bread, oatmeal, soups, cheesecake…..the options are endless! For an Indian twist, I added the puree to dough for making parathas (flatbread). That way I can add more veggies to my daughter’s meals. As you can imagine, one large pumpkin makes a lot of puree and there is no way you can use it all up soon enough. So I stored the puree in small containers in the freezer and will use it for the next 6 months! 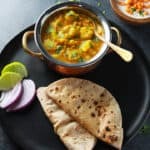 Check out other Instant Pot basics recipes – Applesauce, How to cook chickpeas?, No-boil Yogurt and Cooking Beets in the Instant Pot. 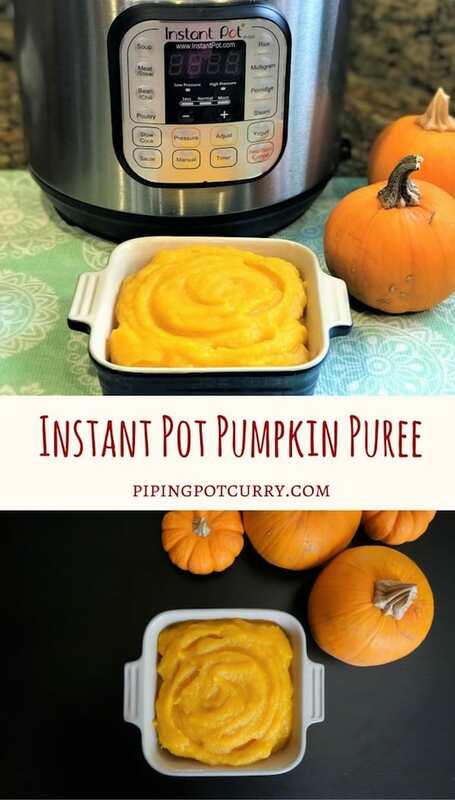 Making fresh pumpkin puree is now so easy in the Instant Pot. NO peeling or cutting of the pumpkin ahead of time. If using, please trivet in the Instant Pot insert and add water to it. Place the pumpkin on the trivet (or directly in the insert). Close the instant pot with vent in sealing position. Set on MANUAL or pressure cook mode for 12 minutes. When the instant pot beeps, let the pressure release naturally. Let the pumpkin cool a bit, then remove it carefully in a large plate or tray. Slice it in half. 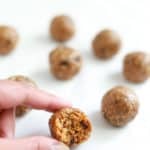 Using a spoon, remove the seeds. Scoop the cooked pumpkin out from the skin. Add it to the food processor or blender. I had to add water to get a smooth texture. Adjust amount of water added to your preference. Pumpkin Puree is ready. Use it or store in refrigerator or freezer. Based on different pumpkin sizes, the cooking time may vary. My pumpkin completely filled the 6qt instant pot, and there was no space for the trivet too. Large Pumpkin: You can cut it into large pieces and place it in the pot. 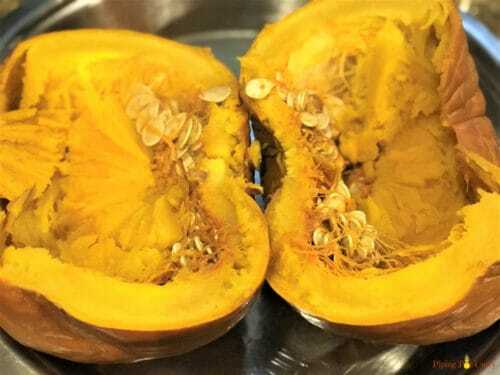 You can remove the seeds before cooking the pumpkin. Cook for just about 10 minutes at high pressure, depending on the size of the pieces. Got Butternut Squash: The same method works! This worked great! I used a butternut squash. 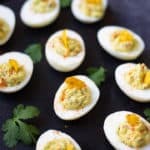 When I pureed it, I used the liquid leftover in the instant pot. Didn’t need much. 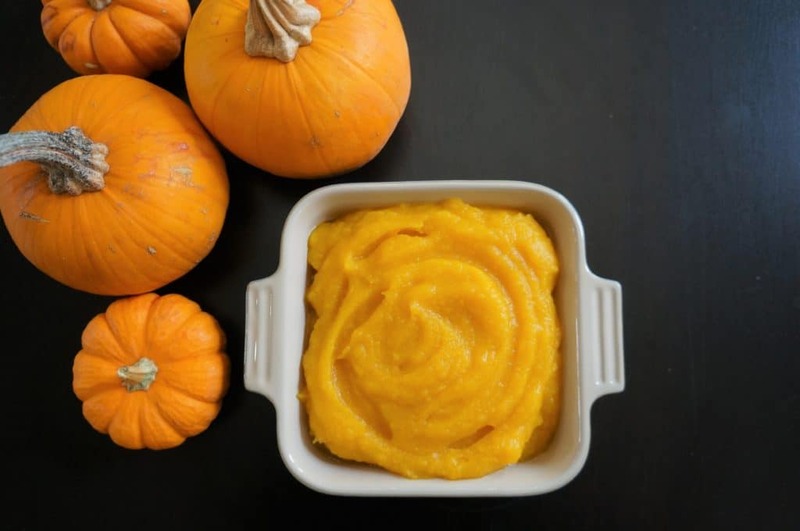 Hey Janet – Glad the pumpkin puree recipe worked great with butternut squash too. Thank you for sharing back your review! Thanks. My husband gave me a Instant pot for my bday I have used it twice. Trying this method with a speghetti squash but also excited to try the pumpkin. Hello Laurie – Congratulations on the new instant pot! I hope the spaghetti squash worked well. This came at a perfect time for me.. I did this and have stored the puree for my 5 mo. Thankyou so much! ??????? ?